This small group class is designed to give you a full body work out using all of the Pilates equipment. You will learn proper breathing, posture, alignment and an understanding of core control. Classes focus on strength, flexibility, balance, posture, mobility and stability. These are just a few of the Pilates benefits. This class moves at a faster pace offering more of a challenge for students who are well versed on the Pilates equipment. This class is designed for the over 60 student. This is a bone strengthening class and will address orthopedic issues including osteoporosis arthritis, joint problems and back care. We will focus on safely improving strength, flexibility, mobility, movement with grace and balance. This class focuses on abdominal and lower back strengthing with a special focus on flexibility and stamina. An aggressive full-body workout! All Pilates enthusiast’s are welcome to take this challenging class. This class is done without the Pilates equipment. Some props are used. No previous experience necessary. One on One, available by appointment. 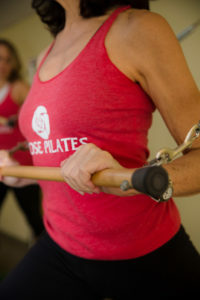 All of the Pilates equipment is used and the session is designed specifically for the individual. Using all of the Pilates equipment. 2 people, available by appointment. 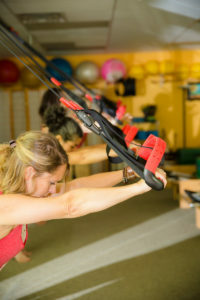 This class is taught from straps with handles suspended from the ceiling. This is a challenging format offering strength, balance and coordination to the entire body. This class is taught on the tower and mat using springs from the tower. This is a mixed level class from beginners to the intermediate student student. You should be able to make adjustments for your self in this class and work appropriately for you own level.